Skywatchers observe the partially eclipsed sun ahead of a total solar eclipse. Seeing this celestial event in person may require some traveling, but is well worth the effort according to most people who have seen one (or multiple). Pictures of the sun in total eclipse make it obvious the event is unusual. What is normally a blindingly bright disk is utterly black and crowned with a pearly halo against a dark sky. The eclipsed sun looks, in fact, like a hole punched in the sky. In a total eclipse, eyewitnesses are awed, exhilarated and inspired. For only a few minutes, everything is suddenly, theatrically and seemingly irrevocably transformed. The sun goes black. The temperature drops. The colors of sunset encircle the entire horizon. Planets pop into view in an oddly darkened sky. And people go a little nuts, thrilled by the grandeur and grateful for the circumstance. A view of the totally eclipsed sun, which makes the sun's atmosphere visible to the naked eye. When you witness a total solar eclipse, you first see all of the familiar partial phases leisurely come and go as the moon gradually encroaches on more and more of the sun. (The partial phase before totality lasts nearly 90 minutes in most cases.) Clear sky is never guaranteed, and so every total eclipse is accompanied by uncertainty that sometimes continues to the moment before totality. The first headliner on the stage of totality is that initial "diamond ring," when a single bead of the sun's disk is visible on the edge of the black moon. Valleys and mountains on the edge of the moon combine to create this one last beam of full sunlight. It's a moment that catches the breath and may seem instantaneous or eternal. The duration and the way the brightness declines are tremendously variable and depend on the exact contours of the moon's edge. It is also still a dangerous time to look at the sun without protection, but once that diamond ring shuts down, you get to remove your Mylar glasses or other approved filter and stare at totality. Then, at totality, you see a lot in what seems like no time at all. It is a wild, uncanny time. It is short — totality will last less than 3 minutes in 2017 — but packed with events. Totality is like suddenly finding yourself in the middle of a three-ring circus. There is never enough time to see and notice everything, and so the eclipse leaves you with the feeling that you have unfinished business. And finally, whatever you see during the eclipse, it is stunning. It is unique. It is memorable. It is the stuff of both dreams and concrete reality. For a while, it seems like the most important thing there is. 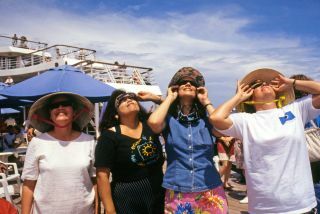 On a cruise to 1998's total solar eclipse in the Caribbean, I collected passenger responses right after the event. The eclipse inspired a spiritual mood in some. One person compared totality to watching the World Series at Candlestick Park in 1989. Most people confirmed that they did at least one stupid thing during the eclipse. I am lucky if my tally during totality is only one. Overtaken by the dynamic character and full-tilt brevity of the event, it is easy to feel rushed and distracted, and that means mistakes if you are trying to do anything more than look. Mesmerized by the corona, I once forgot to lift my binoculars for close-ups of the flame-like prominences and the three-dimensional fabric of the halo surrounding the sun. The "All-American Transcontinental Total Solar Eclipse of 21 Aug. 21, 2017" (as I call it) will be my 15th round with the central shadow of the moon. I keep going back because every eclipse is different. The duration of totality is different. The surrounding landscape is different. The depth of darkness is different. The lighting on the ground is different. The horizon's wraparound colors are different. The change in temperature is different. The planets that appear during eclipse are different. The character and duration of the "diamond rings" of brilliant sunlight that inaugurate and terminate totality are different. The shape of the corona and the number and size of the sinuous prominences protruding from the dark disk are inevitably different from one eclipse to another. During an eclipse, those details on the edge of the obtruding moon change as it gradually slips past the sun and puts the mechanics of the solar system on real-time display. With binoculars, you might catch the chromosphere — an ultrathin layer of singularly red hydrogen gas below the corona — rip open like a scarlet zipper. At that time, the second diamond ring will call a halt to totality, and you will again need protective eyewear. A wide view of a totally eclipsed sun. E.C. Krupp, director of the Griffith Observatory, said every total solar eclipse is slightly different. Most people on the planet don't live within the narrow path of eclipse totality that will cross the U.S. on Aug. 21. And so for those who have to travel to rendezvous with the shadow of the moon, the story is not just the eclipse but also where you go and how you get there. Chasing an eclipse now takes most eclipse devotees to somewhere they've never been, and that also seasons the enterprise with unexpected adventure. Pursuing eclipses is a rather new cultural phenomenon. Eclipse chasing began to become a popular international pastime in 1970, when many people traveled to Mexico to observe a total solar eclipse on March 7. In 1972, the Olympia became the first ship chartered to rendezvous with totality at sea. Over the decades, one eclipse after another has eclipsed the record number of people that migrated to get to the central path. Now that total eclipses of the sun have become mass entertainment, they are also opportunities for merchandising: eclipse lodging, eclipse glasses, eclipse publications, eclipse-viewing real estate, eclipse T-shirts, eclipse postage stamps, eclipse hats, eclipse pins, eclipse buttons, and more. The island of Java put the Hindu eclipse demon on cans of two brands of beer for Indonesia's Great Ramadan Total Solar Eclipse of June 11, 1983. For the ancients, an eclipse was one of the last things anyone wanted to see. Now, total solar eclipses are create destinations of temporary mass migration that transform local economies. They also transform perspective — on life, the universe, and everything. Brutally short, total solar eclipses deliver anxiety, tension, drama, sparkle and passion. For eclipse veterans, every eclipse remains a surprise. For eclipse virgins, the first question after the first eclipse is inevitable: "When is the next one?" E.C. Krupp is an astronomer and the director of the Griffith Observatory in Los Angeles. He is also an expert in the cultural aspects of astronomy throughout the world and through time, including eclipse lore.